Clicking Google advertisements helps keep MusicWeb subscription-free. 305,597 performance reviews were read in December. When Bill Kenny visited Copenhagen’s new opera house in Holmen a couple of years ago he chose the ferry that crosses the water that separates Holmen from the mainland, and had a rather bumpy ride. I played safe on my first visit there and took the bus that stops just a stone’s throw from the main entrance but the violent winds and rains that invaded the south of Scandinavia this weekend still made the short walk a trial. The exterior of the building is impressive and from my seat in the fifth row in the stalls I had a marvellous sound which allowed me to hear practically every word. For further information about the opera house I refer readers to Bill’s review of Die Walküre from December 2005. It was produced by Kasper Bech Holten, Marie í Dali and Jesper Kongshaug and the same team were responsible for the opera I saw. Maskarade, with a libretto by Vilhelm Andersen, based on Ludvig Holberg’s comedy Mascarade from 1724, was premiered on 11 November 1906 and is regarded as the Danish national opera. This performance was the 284th at the Royal Danish Opera, which means that it is one of the most popular operas on the repertoire in Copenhagen during the last one hundred years. Internationally it is less well known than Nielsen’s central orchestral output: the six symphonies, the concertos and a few other works, but during the last decades it has appeared now and then outside Denmark and last year Covent Garden staged it for the first time. I had seen it only once before and that was in Stockholm almost 30 years ago with a splendid cast including the young Gösta Winbergh, Loa Falkman, Arne Tyrén, Barbro Ericson and internationally renowned Wagner tenor Helge Brilioth. It was a fine performance but of course there is something special to see and hear an opera performed in the original language by a cast of – mainly – native speakers. The score is filled with some of the most inspired music Carl Nielsen ever wrote: lively, humoristic, colourful on the one hand; lyrically beautiful with folksong like melodies, closely related to Nielsen’s masterly songs for voice and piano, on the other. The libretto may be less of a masterpiece and the story is fairly predictable, but this is of course something this work has in common with many other operatic comedies – and also a fair amount of boisterous, sometimes even chaotic action that not every opera lover adores. My wife is one of them. She admits the musical qualities and in the last resort she was reluctantly impressed by the staging and the direction at large but would willingly have forsaken some of the “business”. To a certain extent I can agree but for the most part I love this opera, which I have known for a long time through John Frandsen’s Unicorn recording. 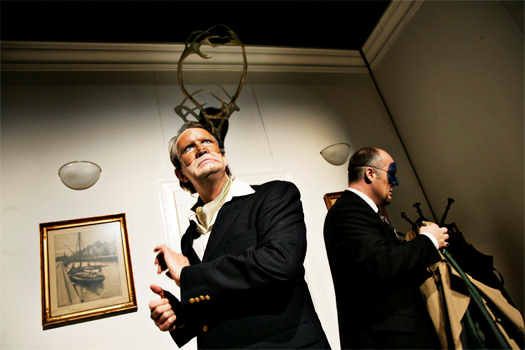 For the first time in the history the Royal Danish Opera have staged Maskarade in a modernized version. Kasper Bech Holten and Morgan Alling have transported it from the time of Holberg to the present day and Holten defends this venture in an essay in the programme book, and his thesis is that even though there is a lot that speaks for sticking to tradition, this could also be seen as a lack of respect for the work, that we don’t believe that it has substance enough to be revived in a new shape. Maskarade is about being Danish and this Danishness is not only nostalgia, we have to interpret it into the present day. This reading of Maskarade is about how the Danish hide behind masks, not at the masquerade but in real life, and it is also about dreams, about letting free the dreams, the passion and the longing. It is a daring reading and there is always a risk that the whole production will fall flat to the ground. But it doesn’t! This production is literally floating above the ground and, most important of all, the direction never goes against the music, as too many modern productions tend to do, but it lives and works in symbiosis with the music, and I can’t give higher praise than this to a production, since the music is after all the kernel of every opera. The state-of-the-art stage machinery allows for advanced technical solutions and the first act played in a number of adjacent rooms, lying in file, and when the action moved from one room to the next the file of rooms moved accordingly, so that the action was always centre stage. At the end of the act the action was reversed and it ended as it started: in Leander and Henrik’s bedroom, seen from a bird’s eye view. The second act was more static with a row of beds against a house front with lots of windows, while the third and final act was in a large theatre with acrobats and crowds of people, one of the acrobats arriving on a wire from somewhere above and behind the audience like The Phantom of the Opera. The whole act was great entertainment and the crowd on stage even invited the audience to join in clapping hands. At the end the ensemble invaded the stalls and surrounded the audience there. This was a performance filled with humour, life and human feelings exposed and there was hardly a moment where there wasn’t something amusing or thrilling or inventive happening – often simultaneously in the background or in an adjacent room as a kind of counterpoint. One shouldn’t reveal too much but when it is time to sleep in act 2 the Sandman arrives in white nightshirt and on inlines! In Denmark and Norway his name is Ole Lukøje and he always carries an umbrella. For a production like this, requiring exact timing and expressive body language, a cast of excellent singing-actors is essential – and that is what the Royal Opera can provide. Singing in one’s mother-tongue certainly facilitates the acting and there wasn’t a weak member in this cast. Christian Christiansen’s rowdy Jeronimus roared, shouted, growled and occasionally sang his way through his role – a kind of distant relative of Falstaff’s. His wife, Magdelone, was impressively sung and acted by Susanne Resmark, who is equipped with a mezzo-soprano voice with beauty as well as power. Poul Elming, in the 1990s Bayreuth’s Siegmund, turned out to be a comedian of stature and in one of the dream sequences in the last act he also showed his skill at chewing and blowing bubblegum. The tenor lead Leander is the one who has the most beautiful music to sing and Niels Jørgen Riis had a fine lyrical voice, slightly reedy but with a fine ring, not least in the magical love duet in the second act. Johan Reuter’s steady and powerful baritone seemed ideal for Henrik and he was also a superb actor. Leonora and Pernille were well performed by Anna Rydberg and Djina Mai-Mai and Ole Hedegaard should be mentioned for his hilarious portrait of the Polish guest worker Arv. The acrobats in the third act offered circus entertainment of the highest order and Geneviève Gauthier’s trapeze numbers were especially outstanding. Veteran conductor Frans Rasmussen lead the Sjaelland Symphony Orchestra in a scintillating performance of Nielsen’s vital score, where the spirited overture set the seal on the whole evening and the opera chorus were excellent. This was a life-enhancing evening and, lo and behold, when we left the opera house the rain had stopped and the wind had started to die away. The power of music?